Our Correspondent ● Kolkata: Saptarshi Prakashan is one of the key Bengali publishing houses in Kolkata now. Though quite younger in age the house is not small in the size of work it has been producing year after year. The quality and diversity of Saptarshi’s book is a primary feature of the organization. Beginning from some path-breaking autobiographical works to modern Bengali poetry Saptarshi is now shaping up the test and attraction of Bengali readership. With more than 600 titles the house is reaching new heights every day. 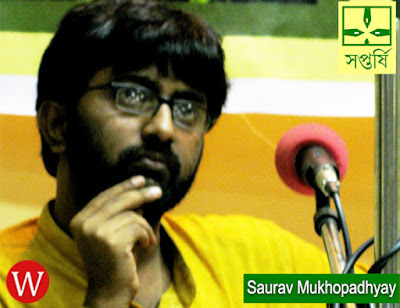 Recently, WPC got the chance to talk to Saurav Mukhopadhyay, the face of Saptarshi Prakashan, just ahead of the International Kolkata Book Fair, 2016. He opened up and talked about their latest ventures. Mukhopadhyay's indomitable spirit and passion for books reflected in his words as always.